Proofreading And Editing - What's The Difference? 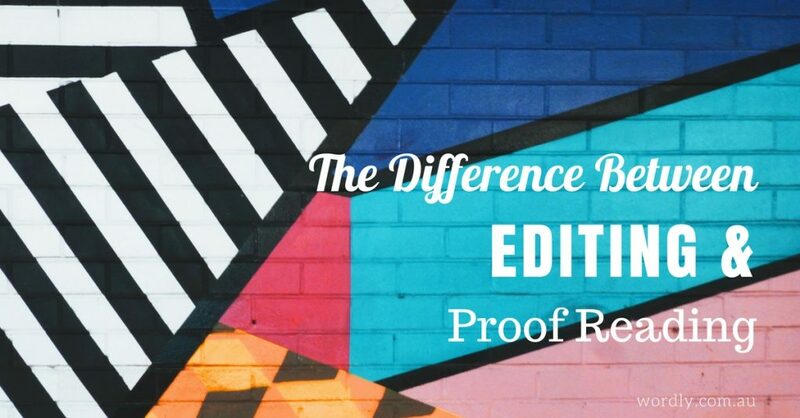 Editing vs Proofreading – What’s the Difference? To a writer, the terms ‘proofreading’ and ‘editing’ are two vastly different concepts. To anyone else, the two words can, and often are, be used interchangeably. While the two do cross over from time to time, when used in their proper context, they play two different roles in writing. When a client first contacts a copywriting firm, they often aren’t quite sure of the correct label for the task they want to be completed. This can lead to miscommunication, and often disappointment as a piece they wanted to be edited is proofread and vice-versa. It is essential to verse yourself in the jargon of the industry, so next time you need a job completed, you’ll know exactly what to say. Do you want your sentence structure changed? Or do you merely want a few commas inserted? These are all things that to be considered when selecting between a proofreader and an editor. To help you out, we have created a simple guide to help you differentiate between the two, so you end up with the right person for the right job. A proactive editor assists in identifying and refining your mistakes, dramatically improving the overall quality of your writing. While people often assume that an editor exists merely to change the spelling and grammar of a piece, this is only one part of the job. The language and expression of writing can drastically alter how it will be read, which is something that an editor has to take into account. After they have inspected the piece, the language should be consistent and sharp, with a clear expression and readability that will help the writing to flow better. Has the proper voice been used by the writer? Active and passive voices can have varying effects on audiences. Is the tone compelling and consistent? Has the author chosen the most useful words to express their intended idea? Have they used too many words to convey something simple? Does their sentence structure need to be shortened? Developmental and structural editing plays a prominent role in deciphering the bigger picture. It may even be the difference between success and failure. No matter how brilliant your ideas, how inspired your logic or how compelling your story, if the writing is not clear, persuasive and free from mistakes – it will not have the desired impact. Simple. After the editing process is complete, then the proofreading can begin. Proofreading ensures that the final copy is free of error. A thorough proofreader will spend time reviewing spelling, punctuation, language use, and ensure there are no typos. This is a vital step when submitting any high standard of text. While many may think that eliminating simple mistakes and inconsistencies can be done through a simple computer program, it is far more complicated than this. A professional proofreader understands the complexities of the English language and can use the fundamentals of grammar, punctuation and syntax to create a better flow between sentences, paragraphs, and create a more polished finished piece. Are there any errors in spelling? Are commas, full stops, hyphens, colons etc. used correctly? Has the writer used quotation marks and apostrophes properly? Does the writing adhere to particular formatting concerns? Double spacing, alignment etc. Proofreading services are a vital final process for any text that is designed for public or commercial consumption. If your submitted writing has simple grammatical mistakes, it can damage your reputation and undermine your professional credibility. The rules embedded within written language exist for a reason. They allow for clairt of expression, which in turn allows for effective communication. Expression and communication are the sole aims of all writing, and without editing and proofreading, you risk missing the opportunity to connect with your audience.